Not what I would have expected to see, here in the great Garden State of New Jersey. I do love coos.... such pretty eyes..
Lovely cattle-quiet breed from what I remember of a herd I went to see at a rare breeds farm in Dorset a long time ago. I didn't get the job, mores the pity. Of the ones I`ve seen in rare breed sales,these cattle in New Jersey are by far better quality. That is right Ty Gwyn, they do look well filled in New Jersey compared to those I saw in UK, I believe in fit not fat but what do I know I'm a pig man! They are beautiful! I thought they were White Park Cattle, are they different breeds? Or are they differently named in the US? Different breeds,White Park are horned and a lot older breed,British White are polled,but their black points are similar,could possibly be graded up from an Angus crossing way back giving the polled gene,similar to Murray Grey cattle in Australia. I think Chris Reeves had some and there were photos on here. Reevesrarebreeds, maybe? Can't find anything using search. But. Lovely white cattle with dangerous horns up near Stafford or somewhere. 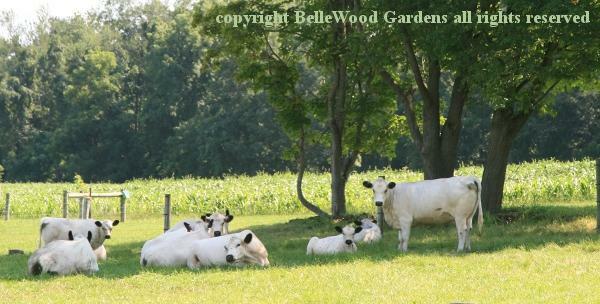 These might be American British White cattle. Not sure of the differences but there is a breed registry with that name. They're described as a calm breed, good mothers, stocky frame, bred for meat but also a mention of good milkers (for calves, maybe?) If I ever stop at the house, knock at the door and ask questions I'll let you know. the NJ ones look like ace beasts and compare well with the breed club examples from both sides of the pond as below. 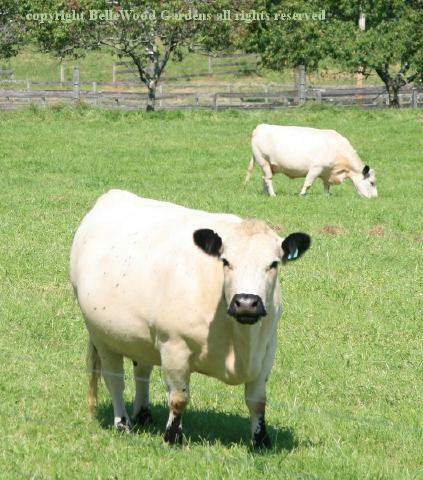 Chillingham are White Park cattle in Northumberland I believe. they are more nimble than their size might suggest and anything closer than about 50m on foot is likely to get one killed unless there is a safe refuge very close , they usually decide to kill you when you are about 30m away, they give little warning. i like em , rob and myself were lucky enough to get a personal tour from the head moo keeper who carried a very large pistol, never got out of the rather solid vehicle if he could avoid it and had a realistic view of his charming critters .